SLTC, founded in 1906, and affiliated to the LTA, is set in unrivalled National Park countryside on the edge of Steep village near Petersfield in East Hampshire. It is run by a Committee of player members. 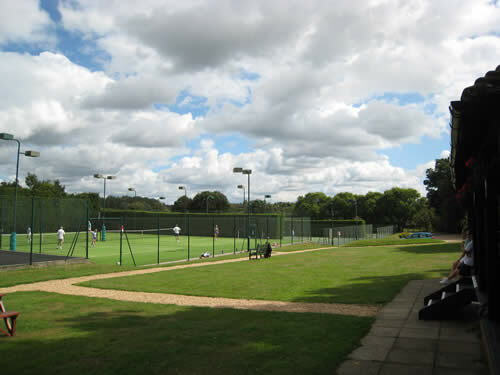 We have 6 hard courts and 2 new artificial clay courts, 6 of which are floodlit for all-year-round play. Our average annual membership is around 500, of which approximately a third are junior members. And we have two LTA qualified coaches offering coaching for all age groups and all standards, for groups and for individuals. Our pavilion style clubhouse, including the changing rooms and kitchen facilities, has recently been refurbished and expanded. SLTC thrives on a mix of social and competitive tennis. We field teams for both the winter and summer county leagues, and all members are invited to attend regular, organised ‘mix-ins’ on Tuesday and Thursday evenings and Saturday afternoons. We organise a full calendar of tournaments and social events, not only at the club but at other local venues. One of the highlights of the year is the Club Championship Finals Day which normally includes Junior as well as Senior matches. SLTC welcomes new members. To join SLTC, to contact us, and find us, and for more detailed information about our coaching, teams, juniors development programme and social activities, please click on the appropriate button.